You can search captions to find a specific part of your text. This can become very handy when you have a large number of captions and text in your project. In the Panel or Storyboard view, select any caption field. ‣ Click the Caption Menu button and select Find Text in Captions. ‣ Select Caption > Find Text in Captions. ‣ Press Ctrl + Shift + F (Windows) or ⌘ + Shift + F (Mac OS X). The Find Text in Captions dialog box opens. ‣ In the Find field, type in the word you are looking for. ‣ Select the Case sensitive option to have the search consider the case of the word. 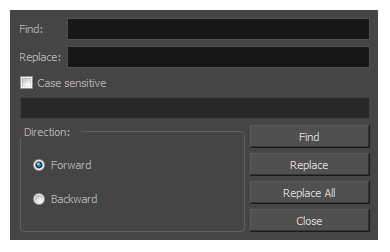 ‣ Select Forward or Backward for the search direction. 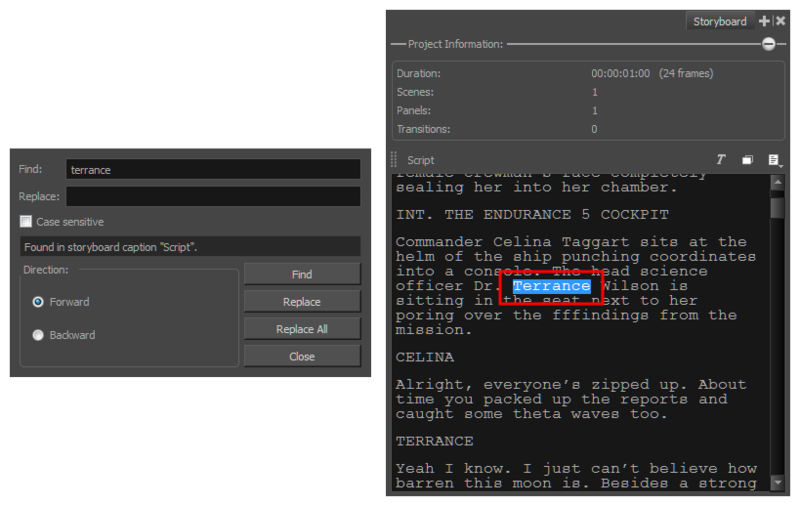 The caption containing the first word fitting your search options is displayed in either the Storyboard or Panel view, and the word is highlighted in blue. The Find Text in Captions dialog box displays information about the caption in which the word was found. Click Find to display the next result.